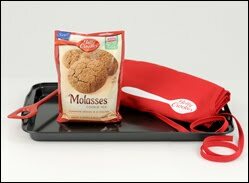 Betty Crocker sent me an awesome gift pack that included a package of their new Molasses cookies. I am not really a fan of boxed or bagged cookie mixes but I decided to give them a try. I do love molasses cookies but the only ones that I like are my Mom's homemade ones. Boy was I in for a treat when I baked up these babies and they tasted just as good if not better then my Mom's. They were really that good. They were so soft and chewy. So, so good! I will never ever make homemade molasses cookies when these cookies are so easy to make and taste so good. The only thing I did differently then the directions called for was I rolled them in balls before baking. The directions call for drop cookies. I just wanted to make them look pretty. Here are some pictures of the process. There Are Five Ways To Enter to win the Betty Crocker Prize Pack (from Betty Crocker and MyBlogSpark): The prize pack includes a baking sheet (shown above), a really cool spatula, a red Betty Crocker Apron (that I wear quite frequently) and a bag of cookie mix. 1. Leave a comment sharing with me your favorite cookie. The Winner will be chosen using a random number generator. All entries must be received by Monday, Oct. 24, 2011 at 11:59 CST. The winner will be announced Tuesday, Oct. 25, 2011. For U.S Addresses Only. MyBlogSpark is responsible for sending the prize pack. Those look yummy! My favorite cookies are my homemade chocolate chip with pudding in the batter. I like Christmas sugar cookies a lot! But after that I probably like peanut butter second best. I love white chocolate chunk and macadamia nut cookies! I just sent you a friend request on Facebook. I love all cookies. However, if I had to pick just one, it would be a Ginger Teacake that my Grandmother used to make. It is soft and chewy and has ginger and molasses in it. My favorite cookie is a chocolate mint type cookie...I make them whenever I can find mint chips in the grocery store.